Recently I visited one of those spacious New York West Side apartments with a fantastic Central Park view. Really the view was enough decoration in itself. But there was much else that made the room a delightful place to be entertained in and to hang out. One of the first things I noticed was that there was no wall to wall carpet, just an eclectic grouping of area rugs and mats. These accent rugs looked like they were all brought back from places like Istanbul, Morocco and the American Southwest� not necessarily expensive, just great looking rugs. None of the area rugs and mats matched but everything went together. Not only did the owner have area rugs and mats on the floor but there was an interesting grouping of them on the wall. Whatever room you use them in, think of area rugs and mats as the first step to an attractive room. 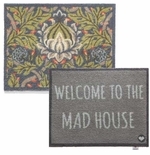 Even before you enter a home, your doormats give a clue to your interior design. You don�t need to travel the world to curate your home collection of area rugs and mats. Decorative Things has everything you need. The idea is to choose area rugs and mats in a variety of designs, colors and shapes, whether slightly complementary in style and color -- or not! 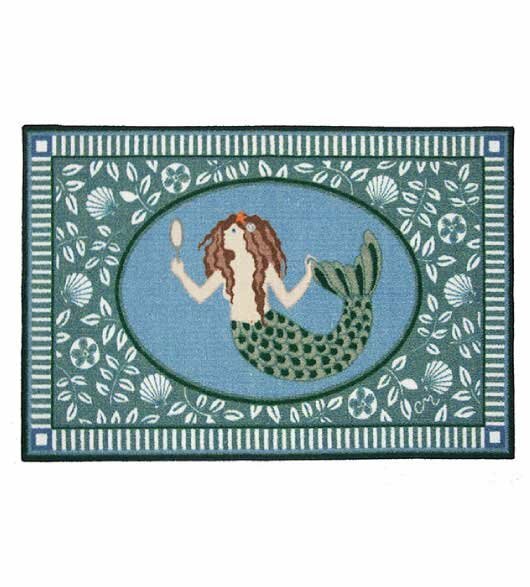 Area rugs and mats are decorative accessories that can make your home special � just like ceramics or wall art. What are the first steps in buying an area rug? Select where the rug will go, and plan out the size and space. Decorative Things has over 50 area rugs and mats, with a great collection for every room in the house. 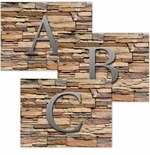 Decorative Things has put together a few thoughts to help you get started. 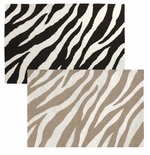 � Lay colorful area rugs and mats on hardwood or concrete floors -- or over wall-to-wall carpet. Both styles are great options, but they have different looks. � Start with the entrance to your home. A warm colorful area rug will welcome guest to your home, as well as keep dirt out. Small rugs, mats and area rugs are generally most appropriate in the foyer or front hall. � Measure your larger living spaces and sketch the desired layout of each room (furniture, lamps, tables, area rugs and mats). These rooms require the most thought � and the most investment -- when selecting area rugs and mats. � Use area rugs and mats to define seating areas in larger living spaces. Area rugs come in a variety of sizes, to decoratively pull the room together. Area rugs and mats in key living spaces � whether a single large rug or a fun assortment of rugs � are key investments. - Choose correctly, and a 5�x8� wool area rug can become the focal point of the room. - Or show your individual style with a Dhurrie rug. 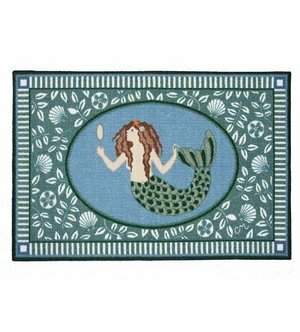 - For a beach or animal pattern, see our Claire Murray kitchen rugs. - Rug runners are perfect for hallways. � Size your dining room accent rugs so that all chairs fit comfortably on the area rug, even when moved away from the table. And remember: area rugs beneath a dining room table will keep the noise level down. � Keep kitchen rugs and kitchen mats near the kitchen sink to protect flooring, but finding the right colorful or themed rug will bring the room to life. Mix it up and try bamboo rugs, or even a polypropylene rugs. � Choose area rugs and mats over wall-to-wall carpet for the �easy-to-clean and replace� factors. Update your home collection of area rugs and mats: it�s easy, affordable, and fun! Decorative Things has the right area rugs and mats for every room in your home, whether your style is classic or contemporary, neutral or colorful, traditional or themed. Create the space you have always imagined with gorgeous accent rugs. Mix and match eye catching area rugs and mats from wherever you find them. Even if you don�t have an apartment or home with a view, and even if you don�t get to travel to exciting places, there�s no place like your home and you can make your rooms as interesting as you want with an area rug inside, or for outdoor spaces, with an outdoor rug. Fabulous, colorful area rugs and mats are a great place to start. Interesting accent rugs and decorative accessories like ceramics, wall hangings, worry beads and the like make home decor special. Do you prefer wall to wall carpet or area rugs? Both rug styles are great options but they have different looks. Carpet can be luxurious for bedroom rugs. But area rugs and mats can feel good under bare feet too and add a feeling of coziness by a bed too. Area rugs are easy to clean and to change when you get tired of them. In the kitchen, kitchen rugs are an important thing to have under a sink to help keep the rest of the floor clean. If you do opt for bare floors, area rugs and mats can be essential to define seating areas. Beneath a dining room table and by the hearth, they keep the noise level down. Dining room accent rugs should be big enough for all four chairs to fit on even when moved away from the table. At your door, you and your guests are greeted by entrance mats, aka doormats, so don�t forget about having inviting doormats for your front door too. Area rugs and mats at the door keep dirt outdoors and add a welcoming touch. Besides the delight of looking at area rugs and mats, they are such practical things. What are the first steps in buying area rugs? Select where the area rug will go and plan out the space. In going through our area rugs, you will be able to find the right rug for every area in your home. Small area rugs are appreciated in the front hall or foyer, but also in the kitchen, bedroom, and bathroom. Mix it up and try 3� x 5� bamboo rugs or even polypropylene rugs for kitchen rugs.? A small change in area rugs and mats can make a huge difference in most homes. If you are dealing with a larger amount of space, invest in larger area rugs. Combing through websites and stores chasing down the perfect design? From classic to contemporary, find a style of area rugs that matches your home. Create the space you have always imagined with area rugs you love. 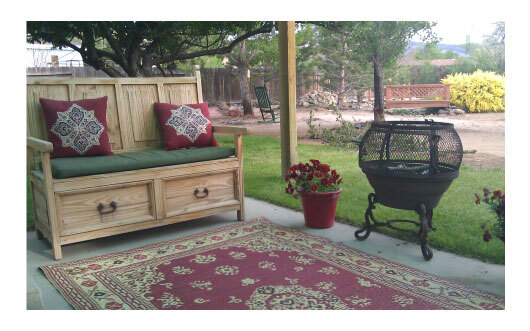 Find choices for every room in your house and for outdoors with outdoor rugs. Show your individual style with a Dhurrie rug. Personalized rugs are another classic decorating idea to make a room more personal. 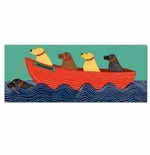 If you are looking for nautical rugs, see our Claire Murray hooked rugs. If you have lots of plain floors to cover, Decorative Things has the answer with a large collection of area rugs and mats for every lifestyle. We've even got runners for your foyer and other hallways. Polypropylene Rug from a customer with flair.